Hip and knee replacements (also called lower extremity joint replacements or LEJR) are the most common inpatient surgery for Medicare beneficiaries and can require lengthy recovery and rehabilitation periods. In 2013, there were more than 400,000 inpatient primary procedures costing more than $7 billion for hospitalization alone. While some incentives already exist for hospitals to avoid postsurgery complications that can result in pain, rehospitalizations, or protracted rehabilitative care, the quality and cost of care for these hip and knee replacement surgeries still varies greatly throughout the country, according to CMS. For instance, the rate of complications like infections or implant failures after surgery can be more than three times higher at some facilities than others, which can lead to hospital readmissions and prolonged recoveries. The average Medicare expenditure for surgery, hospitalization, and recovery ranges from $16,500 to $33,000 across geographic areas. 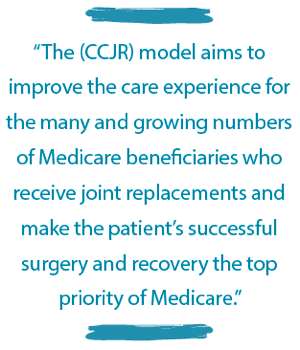 The proposed Comprehensive Care for Joint Replacement (CCJR) model, a five-year demonstration program, is intended to address fragmentation of care by focusing on coordinated, patient-centered care. The model aims to improve the care experience for the many and growing numbers of Medicare beneficiaries who receive joint replacements and make the patient’s successful surgery and recovery the top priority of Medicare. Joint replacements are not only the most commonly performed Medicare inpatient surgery but also their utilization is predicted to continue to grow as our nation’s population ages. They can require long recoveries that may include extensive rehabilitation or other post–acute care, which is frequently fragmented. CMS believes that “bundling” payments for this condition will provide hospitals, physicians, and others a sufficient incentive to work together to deliver more effective and efficient care. A fundamental premise of the program is to reward providers that improve patient outcomes. By including all eligible hospitals in 75 geographic areas across the country, CMS believes this model will drive significant movement toward new payment and care delivery models for an important set of conditions and surgeries for Medicare beneficiaries. The CCJR Model proposes to hold hospitals accountable for the quality of care they deliver to Medicare fee-for-service (FFS) beneficiaries for the full spectrum of care associated with hip and knee replacements. This proposal is consistent with numerous initiatives advanced over the years that have the common goal of transforming Medicare to a system that emphasizes value over volume; that is, incentivizing participants in the program to deliver better quality care and spend federal health care dollars in a more efficient way. Patients will benefit from their hospitals and other health care providers (e.g., physicians, therapists, home health agencies, and nursing facilities) working together more closely to coordinate their care. This should lead to better outcomes, a better experience, and fewer complications such as preventable readmissions, infections, or prolonged rehabilitation and recovery. Hospitals will be paid for the outcomes that patients want. Providers will be held accountable for the quality and cost of services they provide and incentivized to help patients get and stay well. Patients will continue to choose their doctor, hospital, nursing facility, home health agency, therapist, and other provider, but their providers would better coordinate their care. From surgery to recovery, patients would receive more comprehensive, coordinated care from their providers regarding the most appropriate options for their recovery and rehabilitative care. Under this proposed model, the hospital in which the hip or knee replacement takes place would be accountable for the costs and quality of care from the time of the surgery through 90 days after, which is referred to as an “episode” of care. Depending on the hospital’s quality and cost performance during the episode, the hospital would either earn a financial reward or be required to repay Medicare for a portion of the costs. This payment is intended to give hospitals an incentive to work with physicians, home health agencies, nursing facilities, and other providers/professionals to ensure beneficiaries receive the coordinated care they need with the goal of reducing avoidable complications including rehospitalization. Hospitals will have additional tools—such as spending and utilization data and sharing of best practices—to improve the effectiveness of care coordination. Except for those participating in Model 1 or Phase II of Models 2 or 4 of a separate initiative already underway labeled Bundled Payments for Care Improvement (BPCI)2 for LEJR episodes, hospitals paid under the Inpatient Prospective Payment System (IPPS) and physically located in MSAs selected for participation would be required to participate in the proposed model. Hospitals outside these geographic areas would not be able to participate. There is no application process for this model. Beneficiaries would retain their freedom to choose providers and where they receive services. Physicians and hospitals would be expected to continue to meet current standards required by the Medicare program. All existing safeguards to protect beneficiaries and patients would remain in place. If a beneficiary believes that his or her care is adversely affected, he or she is advised to call 1-800-MEDICARE or contact their state’s Quality Improvement Organization by going to www.qioprogram.org/contact-zones. The proposed rule also describes additional monitoring of claims data from participant hospitals to ensure that hospitals continue to provide all necessary services. A LEJR episode would be defined by the admission of an eligible Medicare FFS beneficiary to a hospital paid under the IPPS that eventually results in a discharge paid under MS-DRG 469 (Major joint replacement or reattachment of lower extremity with major complications or comorbidities) or 470 (Major joint replacement or reattachment of lower extremity without major complications or comorbidities). The episode would continue for 90 days following discharge. Part A and Part B services related to the LEJR episode would be included in the episode. Every year during the five performance years of this demonstration, the model would set Medicare episode prices for each participant hospital that includes payment for all related services received by eligible Medicare FFS beneficiaries who have LEJR procedures at that hospital. All providers and suppliers would be paid under the usual payment system rules and procedures of the Medicare program for episode services throughout the year. Following the end of a model performance year, actual spending for the episode (total expenditures for related services under Medicare Parts A and B) would be compared to the Medicare episode price for the responsible hospital. Depending on the participant hospital’s quality and episode spending performance, the hospital may receive an additional payment from Medicare or be required to repay Medicare for a portion of the episode spending. Drugs that are paid outside of the MS-DRG, specifically hemophilia clotting factors (§ 412.115), identified through Health Care Procedural Coding System (HCPCS) code, diagnosis code, and revenue center on IPPS claims, would be excluded from the CCJR. Voluntary THA/TKA data submission on patient-reported outcome measure. In addition, the demonstration project will enable hospitals to have additional tools—such as spending and utilization data and sharing of best practices—to improve the effectiveness of care coordination. However, the meaning of “sharing of best practices” is not clear, nor is it understood how such information will be constituted or what a “best practice” will be based on. Moreover, relying on “utilization data” to analyze effectiveness of the program guarantees that the important metric will be cost and not quality. Unfortunately, what is clear is the hospital control of the program, including control of the money. This is found throughout the proposed rule in references such as “the hospital would earn” or “the hospital would be paid.” This reminds one of the age-old “golden rule”—the party who has the gold, makes the rule. that participant hospitals may wish to enter into financial arrangements with providers and suppliers caring for beneficiaries in CCJR episodes in order to align the financial incentives of those providers and suppliers with the model goals of improving quality and efficiency for LEJR episodes. For example, given that the proposed episode duration is 90 days following discharge from the anchor hospital stay and the episodes are broadly defined, many providers and suppliers other than the participant hospital will furnish related services to beneficiaries during episodes. Those providers and suppliers may include physicians, physician group practices, SNFs, HHAs, IRFs, LTCHs, outpatient therapy providers, and others. [CMS] expects that participant hospitals will identify key providers and suppliers for CCJR beneficiaries in their communities and then establish close partnerships with them to assist the hospital in redesigning care for LEJR episodes to improve quality and efficiency, coordinating and managing care for beneficiaries, monitoring episode performance, and refining care pathways. These providers and suppliers may invest substantial time and other resources in these activities, yet they would neither be the direct recipients of any reconciliation payments (to the hospital) from Medicare, nor directly responsible for repaying Medicare for excess episode spending. Therefore, we believe it is possible that a participant hospital that may receive a reconciliation payment from Medicare or may need to repay Medicare may want to enter into financial arrangements with other providers and suppliers to share risks and rewards under CCJR. that the CCJR collaborator would directly furnish related items or services to a CCJR beneficiary during the episode and/or specifically participate in CCJR model LEJR episode care redesign activities, such as attending CCJR meetings and learning activities; drafting LEJR episode care pathways; reviewing CCJR beneficiaries’ clinical courses; developing episode analytics; or preparing reports of episode performance, under the direction of the participant hospital or another CCJR collaborator that directly furnishes related items and services to CCJR beneficiaries. a limit on Gainsharing Payments to physician or nonphysician CCJR collaborators, as well as to physician group practices, related to Physician Fee Schedule (PFS) payments for services furnished to CCJR beneficiaries. This means that, in addition to playing a role in the participant hospital’s episode spending or quality performance, physician, nonphysician, and physician group practice CCJR collaborators must directly furnish services to CCJR beneficiaries in order to receive a Gainsharing Payment as result of their financial arrangement with the participant hospital. Any such arrangement between a participant hospital and a CCJR collaborator shall be termed a “CCJR Sharing Arrangement” or a “Participation Agreement” and the terms of each such Arrangement must be set forth in a written agreement between the participant hospital and the CCJR collaborator. The CCJR Sharing Arrangements between participant hospitals and CCJR collaborators must be solely related to the contributions of the CCJR collaborators to care redesign that achieve quality and efficiency improvements under this model for CCJR beneficiaries. All Gainsharing Payments (aka “Alignment Payments”) between participant hospitals and CCJR collaborators resulting from these arrangements must be auditable by the Department of Health and Human Services (HHS) to ensure their financial and programmatic integrity. Moreover, the payments must be actually and proportionally related to the care of beneficiaries in a CCJR episode, and the CCJR collaborator must be contributing to the care redesign strategies of the participant hospital. The Medicare Agency also believes hospitals caring for CCJR beneficiaries may want to offer beneficiary incentives to encourage beneficiary adherence to recommended treatment and active patient engagement in recovery. But the proposed rule requires that such incentives be closely related to the provision of high-quality care during the episode and advance a clinical goal for a CCJR beneficiary, and should not serve as inducements to beneficiaries to seek care from the participant hospital or other specific suppliers and providers. The incentive must be provided during CCJR episode of care. There must be a reasonable connection between the item or service and the beneficiary’s medical care. management of chronic diseases and conditions that may be affected by the LEJR procedure. Items of technology comply with certain safeguards regarding value. The hospital must maintain contemporaneous documentation of the incentives provided to beneficiaries for a period of 10 years. The cost of the incentives is not shifted to another federal health care program. In the proposed rule, CMS reiterates its goal of moving toward outcome measures that assess patient-reported outcomes, and the Medicare Agency reports that it has begun development of a measure to assess improvement in patient-reported outcomes following THA/TKA procedures. Unfortunately, the metric will be a Hospital-Level Performance Measure(s) of Patient-Reported Outcomes Following Elective Primary Total Hip and/or Total Knee Arthroplasty. Regrettably, CMS seems unaware of the myriad evidence-based and psychometrically sound measures proven to accurately measure function available and in use in many of our private physical therapy practices on a regular basis.3-20 Some of these outcomes processes are even risk adjusted.5-11 Nevertheless, CMS indicates it has embarked on the development of an outcome metric for these total joint procedures. Regardless of the metric used, producing reliable functional outcomes data will be the key for private practice physical therapists (PTs) to unlock the door to participation in the CCJR demonstration project as it will be only through such proof of effective care (high quality, low cost) that participant hospitals will be inclined to allow a competitor to become a collaborator. In the proposed rule, the Agency emphasizes that the CCJR model does not affect the beneficiary’s freedom of choice to obtain health services from any individual or organization qualified to participate in the Medicare program. However, eligible beneficiaries who choose to receive services from a participant hospital would not have the option to opt out of inclusion in the CCJR model. Although the proposed model allows hospitals to enter into risk-sharing arrangements with certain other providers and these hospitals may recommended those providers to the beneficiary, hospitals may not prevent or restrict beneficiaries to any list of preferred or recommended providers. Many controls exist under Medicare to ensure beneficiary access and quality, and CMS has proposed to use its existing authority, if necessary, to audit participant hospitals if claims analysis indicates an inappropriate change in delivered services. This measure is intended to ensure that participant hospitals do not stint on care or avoid complex, high-cost cases by referring them to nearby facilities or specialty referral centers. CMS also proposes to require providers to supply beneficiaries with written information regarding the design and implications of the CCJR model as well as their rights under Medicare, including their right to use their provider of choice. This article describes many of the more notable facets of the proposed rule pertaining to the lower extremity total joint bundled payment initiative. Admittedly, it is a not-so-pleasant illustration of the direction CMS is moving as it continues along its journey to derive more value from the care provided to Medicare beneficiaries. Many of the features of the CCJR model described in this column may not be included in the final rule which will govern the program for at least the next five years. That final regulation is expected before the end of 2015. The proposed rule can be accessed in the Federal Register at www.federalregister.gov/articles/2015/07/14/2015-17190/medicare-program-comprehensive-care-for-joint-replacement-payment-model-for-acute-care-hospitals. Public comment was accepted until September 8, 2015. PPS submitted extensive comments that can be accessed at www.ppsapta.org. The final rule is expected to be issued before the end of the year with the intention of the program commencing January 1, 2016. Alpha Lillstrom is a registered federal lobbyist working with Connolly Strategies & Initiatives, which has been retained by PPS. An attorney by training, she provides guidance to companies, nonprofit organizations, and political campaigns. For six years, she served as Senior Policy Advisor and Counsel for Health, Judiciary, and Education issues for Senator Jon Tester (Montana), advising and contributing to the development of the Affordable Care Act, as well as working on issues of election law, privacy, government transparency, and accountability. Alpha has also directed Voter Protection efforts for Senators Bob Casey, Al Franken, Russ Feingold, and Mark Begich. She was Senator Franken’s Policy Director during his first campaign and was hand-picked to be the Recount Director for his eventual 312-vote win in 2009. Jerome Connolly, PT, CAE, is a registered federal lobbyist whose firm, Connolly Strategies & Initiatives, has been retained by PPS. A physical therapist by training, he is a former private practitioner who throughout his career has served in leadership roles of PPS and APTA. Connolly also served as APTA’s Senior Vice President for Health Policy from 1995–2001. 1. Medicare Proposed Rule, Federal Register, www.federalregister.gov/articles/2015/07/14/2015-17190/medicare-program-comprehensive-care-for-joint-replacement-payment-model-for-acute-care-hospitals. 2. The Bundled Payments for Care Improvement (BPCI) initiative is comprised of four broadly defined models of care, which link payments for the multiple services beneficiaries receive during an episode of care. Under the initiative, organizations enter into payment arrangements that include financial and performance accountability for episodes of care. http://innovation.cms.gov/initiatives/bundled-payments. 3. Kane RL, Saleh KJ, Wilt TJ, Bershadsky B. The Functional Outcomes of Total Knee Arthroplasty J Bone Joint Surg Am, 2005 Aug; 87 (8): 1719 -1724. 4. Cohen ME, Marino RJ. The tools of disability outcomes research functional status measures. Arch Phys Med Rehabil. 2000;81 Suppl 2:S21-S29. 5. National Quality Forum (NQF) Measure 0422, Functional status change for patients with knee impairments, Focus On Therapeutic Outcomes, Inc., Knoxville TN, www.fotoinc.com/science-of-foto/NQF0422. 6. National Quality Forum (NQF) Measure 0423, Functional status change for patients with Hip impairments, Focus On Therapeutic Outcomes, Inc., Knoxville TN, www.fotoinc.com/science-of-foto/NQF0423. 7. Hart DL, Wang YC, Stratford PW, Mioduski JE. A computerized adaptive test for patients with hip impairments produced valid and responsive measures of function. Arch Phys Med Rehabil. 2008;89:2129-2139. 8. Hart DL, Wang YC, Stratford PW, Mioduski JE. Computerized adaptive test for patients with knee impairments produced valid and sensitive measures of function. J Clin Epidemiol. 2008;61(11):1113-1124.
in patients with knee impairments. Phys Ther. 1996;76 (11): 1178-1187. 10. Wang YC, Hart DL, Stratford PW, Mioduski JE. Clinical interpretation of computerized adaptive test-generated outcome measures in patients with knee impairments. Arch Phys Med Rehabil. 2009;90(8):1340-8. 11. Fritz JM, Hunter SJ, Tracy DM, Brennan GP. Utilization and clinical outcomes of outpatient physical therapy for Medicare beneficiaries with musculoskeletal conditions. Phys Ther. 2011;91:330-345. 12. World Health Organization. International Classification of Functioning, Disability and Health: ICF. Geneva, Switzerland: World Health Organization; 2001. 13. Marx RG, Jones EC, Atwan NC, Closkey RF, Salvati EA, and Sculco TP. Using Patient-Based Measures of Outcome Measuring Improvement Following Total Hip and Knee Arthroplasty, J Bone Joint Surg Am. 87:1999-2005, 2005. 14. Wylde V, Blom AW, Whitehouse SL, Taylor AH, Pattison GT, Bannister GC. Patient-reported outcomes after total hip and knee replacement: comparison of mid-term results. Journal of Arthroplasty, 24(2). (2009). 15. Fortin PR, Clarke AE, Joseph L, et al. Outcomes of total hip and knee replacement: preoperative functional status predicts outcomes at six months after surgery, Arthritis & Rheumatology, 04/2001; 42(8):1722-1728. 16. Ritter MA, Albohm MJ, Keating M, Faris PM, Meding JB. Comparative outcomes of total joint arthroplasty. Journal of Arthroplasty, 1995;10:737-41. 17. Hart DL, Mioduski JE, Stratford PW. Simulated computerized adaptive tests for measuring functional status were efficient with good discriminant validity in patients with hip, knee, or foot/ankle impairments. J Clin Epidemiol. 2005;58(6):629-638. 18. 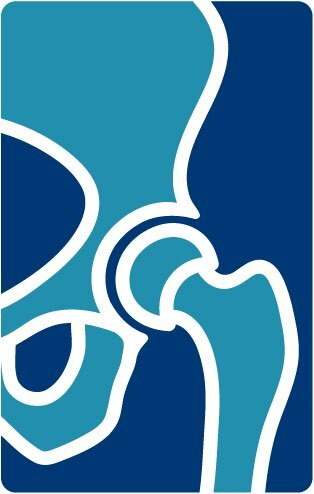 Bachmeier CJM, March LM, Cross MJ, A comparison of outcomes in osteoarthritis patients undergoing total hip and knee replacement surgery, Osteoarthritis and Cartilage, Volume 9, Issue 2, February 2001. 19. Jones CA, Voaklander DC, Johnston DW, Suarez-Almazor ME, The Effect of Age on Pain, Function, and Quality of Life After Total Hip and Knee Arthroplasty, Arch Intern Med. 2001;161(3):454-460. 20. Fortin PR, Penrod JR, Clarke AE, St-Pierre Y, Joseph L, Bélisle P, Liang MH, Ferland D, Phillips CB, Mahomed N, Tanzer M, Sledge C, Fossel AH, N. Timing of total joint replacement affects clinical outcomes among patients with osteoarthritis of the hip or knee, Arthritis and Rheumatism, 12 DEC 2002.